Shoulder impingement syndrome is one of the most common shoulder causes of shoulder pain resulting in loss of range of motion and function. Those who may have shoulder impingement usually complain of pain exacerbated by lying on the painful shoulder and or when reaching the arm overhead. Normal daily activities such as combing one’s hair, showering, or reaching up into a cupboard become painful, and a general loss of strength may be noted as well. 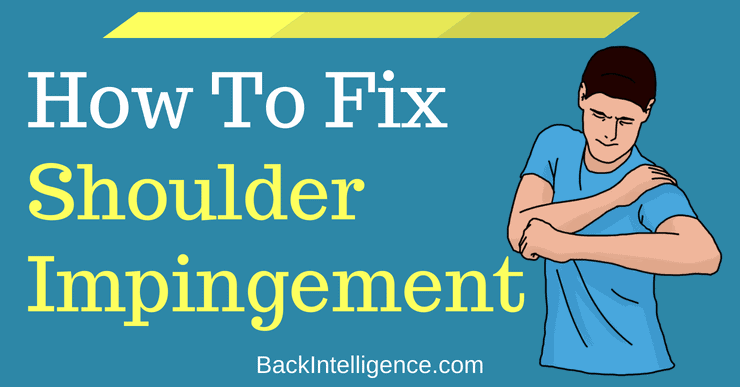 The good news is that with the simple shoulder impingement exercises below you can ease your pain, but first let’s discuss this condition a little more. 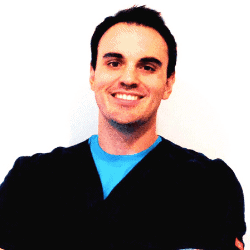 What are the Main Causes of Shoulder Impingement? 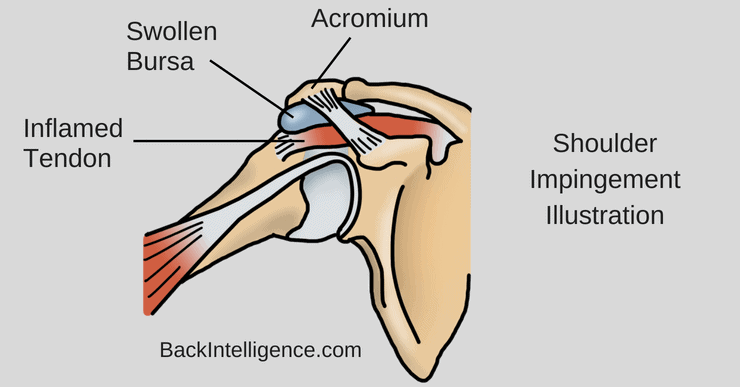 Multiple factors have been proposed as contributing to the developing shoulder impingement. •	Poor shoulder movement associated with dysfunction of the rotator cuff and scapular muscles, capsular tightness. •	Overuse secondary to sustained intensive work. •	Repetitive overhead movements, such as golfing, throwing, racquet sports, and swimming, or frequent overhead reaching or lifting. •	Injury, such as a fall, where the shoulder gets compressed. •	Bony abnormalities of the acromion, which narrow the subacromial space. •	Osteoarthritis in the shoulder region. 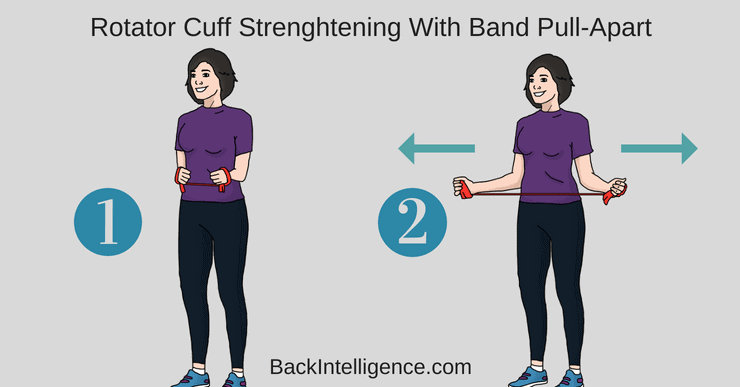 •	Poor rotator cuff and shoulder blade muscle strength, causing the humeral head to move abnormally. •	Thickening of the bursa. •	Thickening of the ligaments in the area. •	Tightness of the soft tissue around the shoulder joint called the joint capsule. Leon’s Notes: Many folks with shoulder impingement usually have a forward neck posture and rounded shoulders too. This is a very similar to the well known Hawkins Kennedy shoulder impingement test, but you can do this one on your own. 1. Take the hand on the affected side and place in on the opposite shoulder (the shoulder with no pain). Your elbow should be bent and resting down toward your chest. 2. Now try to lift the elbow up, toward your face. 3. 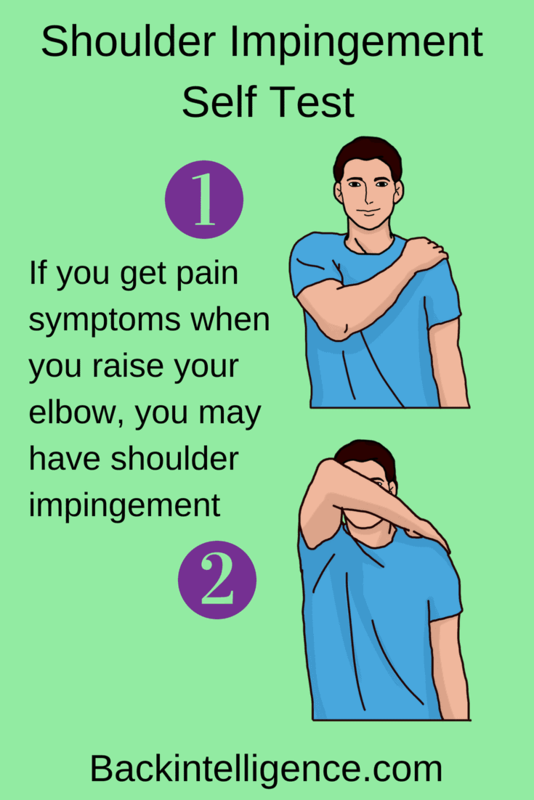 If this causes pain, it suggests that a shoulder impingement is likely behind your troubles. Ice can be applied via cold pack, ice pack, or ice cup massage. Ice is for calming down damaged superficial and deep tissues that are inflamed. SECONDLY, Self massage with a ball to alleviate immediate pain. 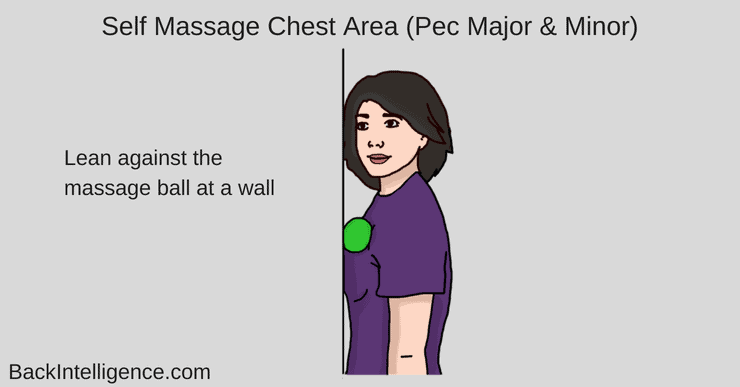 •	Areas to self massage include: Biceps Tendon (top of biceps), Deltoids, and Chest (Pecs). If you are new to this start with a tennis ball, if you are more advanced progress to a lacrosse or frozen softball. See image below. •	One of the most overlooked causes of shoulder pain is a stiff, tight, and overworked tendons of the upper body musclulature, so we want to focus on this area first and then the rest of the shoulder. Remember, healthy tissue is pain free tissue so attack those painful spots first as tolerated. Research has found that those who have shoulder impingement and incorporate thoracic extension have had superior results with their recovery compared to those who don’t. So always a good start to add range, before we load it. 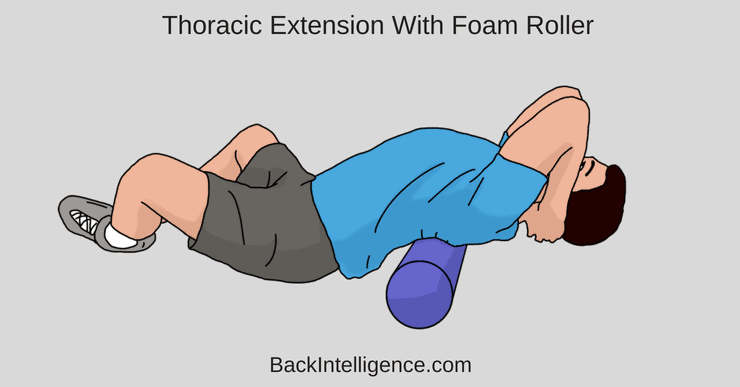 – Use a foam roll or a rolled up yoga mat. – Lie down on your back with your knees bent, feet on the floor, and have the foam roll just underneath your shoulder blades. – Bring your hands behind your head and perform the “J-loop” as you extend your thoracic spine over the foam roll. – Hold for 5-10 seconds and repeat 10 times. 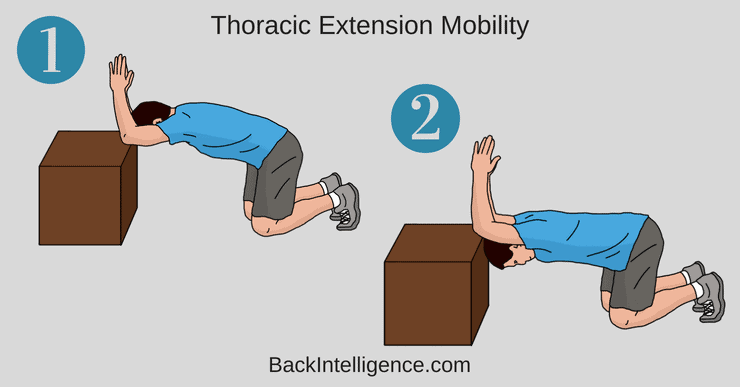 This is another thoracic extension you can try, that provides a little more leverage than the 1st variation above. – Position your elbows on something that is roughly level with your hips. – Move into maximum upper back extension as you sink down towards the floor. – Keep your pelvis in a posterior tilt the whole tie. – One you reach maximum extension, hold for 20-30 seconds and repeat 3 times. One of the biggest causes of shoulder impingement is weak rotator cuff muscles, so we want to focus on strengthening these first so we retrain the body how to move the shoulder appropriately. 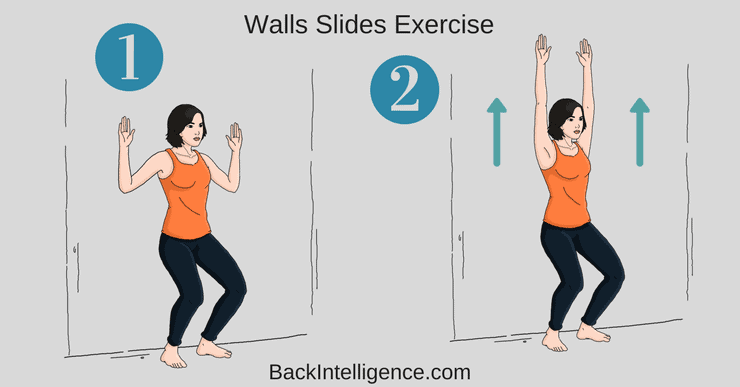 – Begin standing at wall with elbows in at side and palms up holding resistance band. – Squeeze shoulder blades together and pull band apart by externally rotating shoulders. – Keep the forearms tucked in the whole time, meaning there should not be much space between the elbow and your body. – Strive for 10 reps and do 3 sets. This exercise is meant to strengthen your middle and lower trapezius muscles, which will help you maintain a good posture. – Lie face down with your palms resting on the floor, palms down. – Slow externally rotate your arms, and lift them up off the floor. 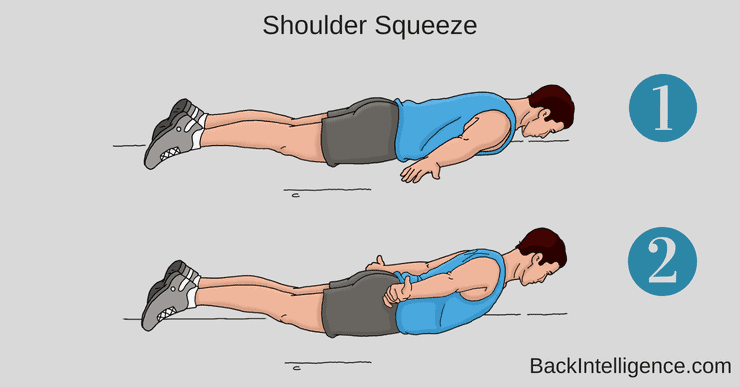 – Squeeze your shoulder blades and hold for 1-2 seconds. – Repeat 10 times and do 3 sets. This exercise strengthens the shoulder stabilizer muscles, as well as opens up your chest. 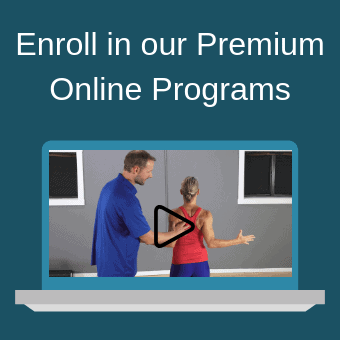 We hope you enjoyed these shoulder impingement exercises and that they will work for you. 1. Camargo, P., Haik, M., Ludewig, P., Filho, R., Mattiello-Rosa, S. and Salvini, T. (2009). Effects of strengthening and stretching exercises applied during working hours on pain and physical impairment in workers with subacromial impingement syndrome. Physiotherapy Theory and Practice, [online] 25(7), pp.463-475. Available at: http://www.tandfonline.com/doi/full/10.3109/09593980802662145 [Accessed 5 Apr. 2016]. 2. De Mey, K., Danneels, L., Cagnie, B. and Cools, A. (2012). Scapular Muscle Rehabilitation Exercises in Overhead Athletes With Impingement Symptoms: Effect of a 6-Week Training Program on Muscle Recruitment and Functional Outcome. The American Journal of Sports Medicine, [online] 40(8), pp.1906-1915. Available at: http://ajs.sagepub.com/content/40/8/1906 [Accessed 5 Apr. 2016]. 3. Holmgren, T., Bjornsson Hallgren, H., Oberg, B., Adolfsson, L. and Johansson, K. (2012). Effect of specific exercise strategy on need for surgery in patients with subacromial impingement syndrome: randomised controlled study. BMJ, [online] 344(feb20 1), pp.e787-e787. Available at: http://dx.doi.org/10.1136/bmj.e787 [Accessed 5 Apr. 2016].